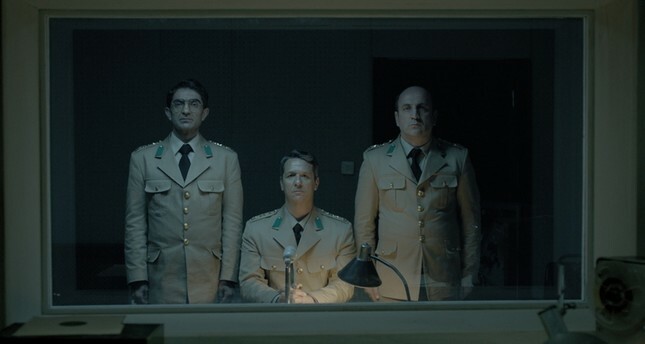 A Turkish dark-comedy film "Anons (The Announcement)" received a major award at the 75th Venice Film Festival. Directed by Mahmut Fazıl Coşkun, the film was awarded with Best Mediterranean Film prize, which is given by the Italian National Syndicate of Film Journalists and the Academy of Fine Arts, in Venice at the festival on Friday. The award-winning Turkish director's third film focuses on four soldiers' long journey during the night of a coup attempt in the 60s. The film takes place in 1963, in the last days of May. Lt. Şinasi, Cmdr. Kemal, Cmdr. Rıfat and Col. Reha are planning to announce a military coup declaration that will start in Ankara on Istanbul Radio. After an effective and strong announcement, they are sure that the coup attempt will be successful, and that public will support them. But nothing will go as they expected. These four soldiers who believe that everything could be solved with planning and military force feel that they can decide on behalf of others. But what defeats them is the invisible power of civil life. Produced by Filmotto, "Announcement" is a co-production of BKM (Turkey) and Chouchkov Brothers (Bulgaria) and has been shot with the support of the Culture and Tourism Ministry, the Ministry Cinema General Directorate and Bulgaria Movie Center. It was produced by Halil Kardaş, Tarık Tufan, Borislav Chouchkov, Viktor Chouchkov and Georgi Abrashev. The movie will be released in the coming months and continue its festival journey. The film, which premiered at the festival, also competes in the Orizzonti (Horizons) section against 18 movies. The winner of the 75th Venice Film Festival will be announced on Saturday.